Although the Universe may seem spacious most galaxies are clumped together in groups or clusters and a neighbor is never far away. But a rare galaxy, known as NGC 6503, has found itself in a lonely position, shown here at the edge of a strangely empty patch of space called the Local Void, a patch of space thought to be about 150 million light-years across that seems to be curiously devoid of galaxies. 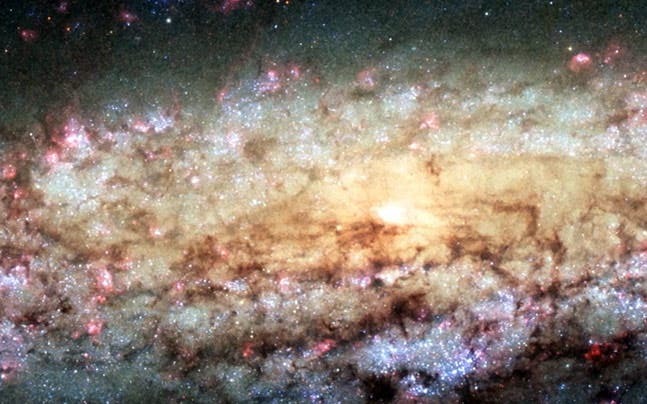 Astronomers using Hubble discovered that the emptiness of this region has quite an effect on the space around us — the Milky Way is being strongly pulled away from it by the gentle but relentless tug of other nearby galaxies. NGC 6503 is only some 18 million light-years away from us in the constellation of Draco (The Dragon), making it one of the closest neighbors from our Local Group. It spans some 30 000 light-years, about a third of the size of the Milky Way. The galaxy's lonely location led stargazer Stephen James O'Meara to dub it the "Lost-In-Space galaxy" in his 2007 book Hidden Treasures . This galaxy does not just offer poetic inspiration; it is also the subject of ongoing research. 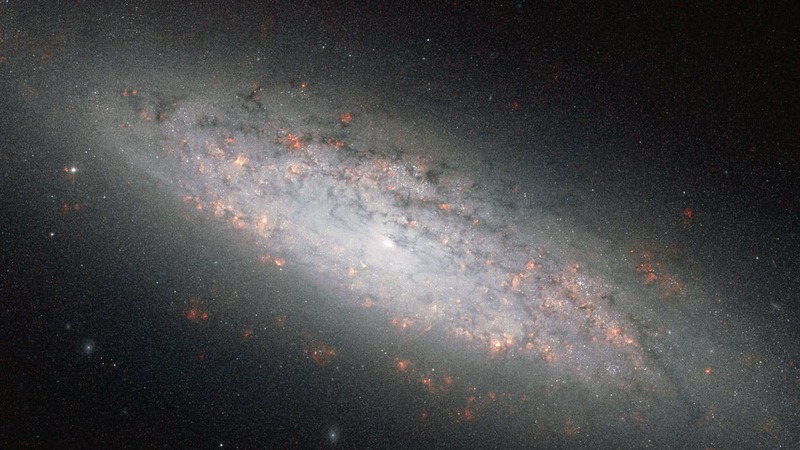 The Hubble Legacy ExtraGalactic UV Survey (LEGUS) is exploring a sample of nearby galaxies, including NGC 6503, to study their shape, internal structure, and the properties and behaviour of their stars. This survey uses 154 orbits of time on Hubble; by contrast, a typical Hubble observing programme lasts from a few to a few tens of orbits. NGC 6503 lies right on the edge of this void. It has an almost non-existent central bulge surrounded by a massive halo of gas. The galaxy's central region is a good example of something known as a "low ionisation nuclear emission region", or LINER. These are less luminous than some of the brightest galaxies. Emission from NGC 6503's heart is believed to be the result of a starved black hole that is only just being kept active, receiving a very small amount of infalling gas to keep its large appetite at bay. A previous image of NGC 6503 was released as a Hubble Picture of the Week back in 2010, taken by Hubble's Advanced Camera for Surveys. However, this new image, taken using Hubble's Wide Field Camera 3 (WFC3), shows NGC 6503 in striking detail and with a richer set of colours. Bright red patches of gas can be seen scattered through its swirling spiral arms, mixed with bright blue regions that contain newly-forming stars. Dark brown dust lanes snake across the galaxy's bright arms and centre, giving it a mottled appearance. Installed in 2009 during the final Hubble servicing mission, SM4, WFC3 covers a wide range of the spectrum, from the ultraviolet all the way through to the near-infrared. Compared with its predecessor, the Wide Field and Planetary Camera 2 (WFPC2), it offers improved resolution and a wider field of view, and has led to a large number of stunning Hubble images since its installation.